Militarized police raid a #NoDAPL resistance camp in Cannonball, N.D., on Oct. 27, 2016. Hundreds of militarized police were deployed Thursday to a resistance camp built by Native American water protectors in the path of the proposed $3.8 billion Dakota Access Pipeline in Cannonball, N.D.
Democracy Now! 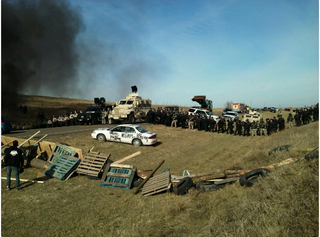 reports that photos and multiple videos posted to Facebook Live show over 100 officers in riot gear—flanked by multiple mine-resistant ambush-protected military vehicles, a sound cannon, an armored truck and a bulldozer—lined up across North Dakota’s Highway 1806. Water protectors also report that the police presence includes multiple snipers. According to Democracy Now!, the police are evicting the camp in order to clear the way for the Dakota Access pipeline company to continue construction. Behind the police line, the company is carrying out construction with cranes and bulldozers on the same sacred burial site where unlicensed Dakota Access security guards unleashed dogs and pepper spray against Native Americans on Sept. 3. In response to the police presence, water protectors have set up a blockade on the highway using cars, tires and fire while elders lead prayer ceremonies. Daniel Goldtooth, a member of the Indigenous Environmental Network, posted a Facebook Live video just before 2 p.m. local time and reported that police had begun arresting water protectors. Democracy Now! reports that ahead of today’s police action, the Federal Aviation Administration issued a temporary no-fly zone for the area above the resistance camp for all aircraft except for those used by law enforcement. That order means that the Native Americans can no longer fly drones to document police activity, but the police can continue to use their drones and helicopters for surveillance. Read more at Democracy Now!